This book is like none other, because it deals with gold found on the East Coast of North America. The scope of the book takes us all the way from Greenland, through Eastern Canada and the United States all the way to Alabama. This includes chapters on each of the individual areas whether they are states or provinces. It also includes chapters explaining the technical aspects of hunting for gold in this area. It does not include places where to hunt for gold because if I knew the places I’d be there first. It does explain where to hunt for gold and the geological reasons behind the hunt. It also explains the geological terrain where gold is most likely to be found. We aren’t ready to take orders, but the book will be ready by Christmas; we hope to have it by Halloween. There are several items that over the years we have found to be handy added to our exploration kit. Probably one of the handiest and incidentally the heaviest is a steel anvil 3 inches in diameter by 1 inch thick. This is used for a simple test for gold. Gold is malleable and can be flattened with repeated blows with a hammer. So-called fools gold is brittle breaking up into several fragments, and if reduced to powder turns black. Gold will retain its true color everything else turns black or in the case of mica turns white. A hat to shield your punkin head from the hot sun is one of the most valuable things you can have during a prospecting expedition. A hat also keeps the rain off your head if it starts raining. A simple bill cap will help, but a broad brimmed hat like the cowboy’s wear is even better. The best one is a hard hat to protect your head from falling objects. Gloves are another thing you shouldn’t be without because after a day of shoveling or hammering you are likely to find that one of the things you’ve got is a good set of blisters among other things. The best work gloves for the prospector are leather work gloves. If you are hunting for gold anywhere there are snakes, and there are always plenty of snakes wherever there is gold you need a pair of snake proof boots. A rattlesnake can strike so hard that even with snake boots you can still be bruised through your boots. A snake bite can ruin your day. If you are messing around in streams one of the most handiest things you can have is a pair of rubber boots, preferably hip boots. One of the handiest things you can have on a prospecting expedition is a good jeweler’s 10X loup. Why a 10X because it has a depth of field that is deep enough to bring things into focus. Loupes larger then a magnification of 10x have a much shorter depth od field to render them virtually useless. In the same vein a pad and pencil also comes in handy for making notes. A surveyor’s pad works best because they have water-proof paper. You could also include a ball point pen. The really most handy things to have is a good handheld GPS unit. You can set it at your base station so you will always be able to return. It is also handy for finding other places where you have been. Another use for one of these is using it for laying out claims. According to Mindat.org gold has a specific gravity ranging from 16 to 19 depending on how pure it is. Hardness is 2.5 to 3. This is enough to identify four minerals. Most of the questions can be answered by a simple yes or no. By answering these questions you will be able to identify most minerals from a simple handbook of minerals that are available at any bookstore. Mineral identification is done by a process of elimination. What doesn’t match the description of your mineral is not what you have found. The new entrance to Mine #1 The shaft is 40 feet deep with an adit going off from the bottom northweat for 10 feet that is 6 feet wide and 7 feet high. The adit is well timbered and the shaft was filled with debris dating back to the 19th Century. We have rediscovered an old mining complex in western Connecticut that to date comprises two mine shafts with accompanying adits. The first mine consists of a shaft approximately forty feet deep with an adit going off to the northwest that is ten feet long, six feet wide and sever feet high. 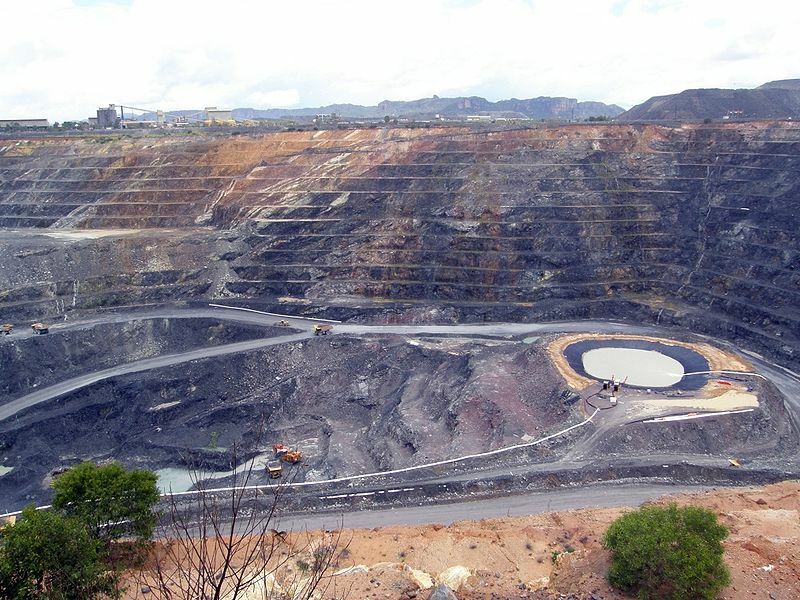 Town records reveal the first mine was a prospect hole that may have been created in pre-Revolutionary days; the second mine was just discovered on July 30, 2012 and is yet to be explored. Town records indicate this mine may have an adit up to 140 feet long. At the end of May 2012 a blue ribbon committee was convened at the site consisting of Charles Merguerian of Hofstra University, Nicholas Bellantoni of Uconn, Stefan Nicholescue of Yale, John Carter of Geotek and two engineers, none of us could determine what they were mining. The town P&Z Officer finally discovered some old records that divulged the fact the second mine was dated to 1858. The mineral mined was chalcocite an ore of copper. The mines were found within two miles of Cameron’s Line a major fault system that extends from Staten Island, NY the western mountains of Norway under a series of different names. There are several important mines located in the proximity of this suture zone producing gold, silver and copper. The largest copper mine in the U.S. before the discovery of copper in the Keweenah Peninsula of Michigan was the Argo Mine in Vermont that is also associated with this large fault system. The property where these mines are located is highly mineralized containing in addition to chalcocite, malachite, pyrites, quartz, kyanite, ilmenite, magnetite, cerrussite, beryl and many other minerals yet to be identified. Although there are no plans to resume mining operations at these old mines mineral specimens will be available for sale. For further information contact John Carter at geotekllc@gmail.com or 860-469-4804. Many of the specimens of kyanite, ilmenite and magnetite are of museum quality and are really spectacular. Some of these specimens are on display at the Yale Peabody Museum in New Haven, CT.
Gold mining prisoners in the Kolyma Basin. 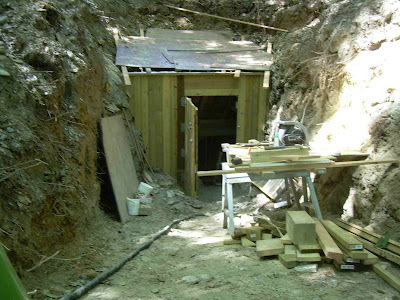 They are mining placer gold that is found throughout the area. The Gulag Ore Field or more correctly the Ducat gold/silver deposit that is located in the central part of the Balygychan-Sugoi trough that is a graben shaped depression that is located near the town of Omsukchan, Kolyma that adjoins to its north the Okhotsk – Chukota a marginal continental volcanic belt. The deposits of gold are centered on a Cretaceous (ca. 120 million year old) volcanic dome consisting of ultra-potassic rhyolites, ignimbrites and tuff that are interlayered with black argillites. The whole volcanic complex is intruded at depth by a late Cretaceous (ca. 85 million year old) granite that is from 1,200 – 1,300 meters below the surface. There were pulses of igneous activity that caused hydrothermal activity to occur in the dome that involved large quantities of fractured, porous and highly permeable Cretaceous rhyolite sills and other steeply dipping subvolcanic bodies to be affected covering an area that covered more then 25 square kilometers. Most of the known mineralization was later to the younger intrusion that includes tin bearing greisen-type that occurs in the contact zones of the granitic plutons. They ore deposits himself were located at a considerable distance from the granite. Part of the Kolyma Basin is within the Arctic Circle giving it a sub-Arctic climate having very cold winters that can last for up to six months. Most of the area is covered with permafrost and tundra. During the winter temperatures range from -19°C to -38°C with even lower temperatures found in the interior. Besides gold there are also rich reserves of silver, 10, tungsten, mercury, antimony, coal, oil and peat. It has been estimated that the area contains in addition to gold 1.2 billion tons of oil and one point 5,000,000,000 m³ of gas. This is the area whose mineral wealth was discovered by Yuri Bilibin in the 1920s that was quickly developed into the infamous Gulag prison camps by Stalin in the 1930s. There was also the area Bilibin used as the model for his theory of Metallogeny and Global Tectonics that has gained much traction sense of the world of geology. Gold and platinum were found in the Kolyma during the time when industrialization began in the USSR under Stalin’s First Five Year Plan in a period when the need for capital that would finance this economic development. The Kolyma Basin gold was a perfect fit and development of the basin began in 1932 based on prisoner labor. In 1932 construction began on Kolyma Highway into the interior those that become known as the Road of Bones because of the number of people in Paris in its construction. This role eventually came to serve 80 different camps that were not have around the region of the uninhabited taiga. The first director of the Kolyma camps was Eduard Berzin who was the Cheka officer that was removed in 1937 and shot during the period of great purges of the USSR. Far Eastern Russia geologically is North American plate that also includes Kamchatka Peninsula in northern Hokkaido Island of Japan. This being so it is probable that the gold deposits of this part of Siberia are closely related to those found in the Tintina gold belt of Alaska. It also indicates that most landmasses on Earth are really just one supercontinent with the sole exception being Antarctica. We finally did it! We can answer just about anything about gold or gems for a minimum of $50 per answer and up. You can reach us at geotekllc@gmail.com. A prospector's school in Barkhamsted, CT? We have added classes in mineral collecting! The School is growing with new classes and programs. I am a graduate geologist with a background in environmental affairs and prospecting. I currently operate a school for prospectors in Barkhamsted, Connecticut. This is the first school for prospectors south of the Province of Quebec, Canada!!! If you like to read about gems and gemstones go here! Copyright John Carter, Barkhamsted, Connecticut 2010, 2011. All rights reserved.. Simple theme. Theme images by luoman. Powered by Blogger.